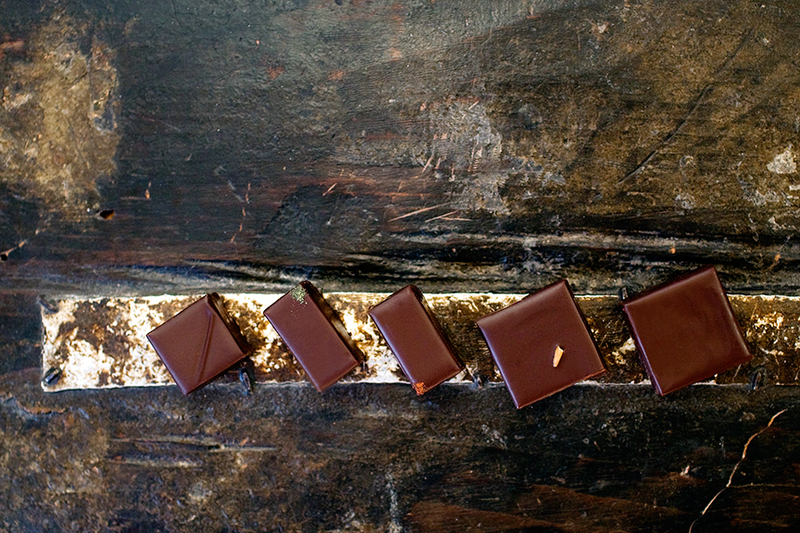 in the order of which they appear (l-r): dark chocolate/espresso, dark chocolate/basil-lemon, dark chocolate/saffron-almond, dark chocolate, dark chocolate/chestnut. …well, it’s day two here in Paris, and without going into all of the emotional baggage, it has been hard to adjust. I always knew that I just knew a little French…but I didn’t know how little that indeed was. Putting sentences together is not my specialty at the moment. Sure, I can say all sorts of French things in my head, and they sound absolutely lovely (some of which, I’m not sure what they mean, but they are in there), but once I start to speak, it becomes a mix of stuttering half French/half English babble. Frankly put, after a lovely but embarrassing dinner party upon my arrival last night, I was a little fearful of going outside on my own to buy food. It took the morning and most of the afternoon before I decided that my bag of ‘airplane snack’ pumpkin seeds was just not going to be enough substance for the day. I made a plan, I would only buy things that I knew how to pronounce – took a deep breath – put on my coat and boots – and headed out the door. And yes, it was very nice to finally get outside, and walk around – just had to let go of that initial fear. Tomorrow is another day, and I certainly have a lot of time to explore! I’m pretty sure language lessons are in my not too distant future as well – then perhaps I won’t be just eating fruit and baguettes!? Last night, I joined a group of about 40+ Flickrites at EMP/Seattle Center for an evening of light-weight strobe lighting and gussied up models. There were umbrellas EVERYWHERE! I knew going into it that what I was about to participate in wasn’t really my ‘thing’ – give me the sun and maybe a white card or two and I’m a happy girl. But I thought this posed a challenge to the normal ‘sun kissed’ photos – not to mention there would be models at my disposal – another unique, “I don’t normally shoot people”, out of my element sort of experiment. I’m always amazed by how pleased I am when I do have people in the shot. When shooting food it is always about trying to find the life on the plate, where with people, all you have to do is tell them where to sit/stand and life is just blaring through the lens. I understand why people like to shoot portraits – it is quite magical. Well, trying to stay true to my passion and craft, I brought a prop along with me. I first thought cupcakes, but then I remembered where we were shooting (near the fun forest theme park), so I opted for pink cotton candy instead. A food photographer can’t shoot without food! Now, in my humble opinion, the margarita is all about two ingredients: limes and salt. Tequila, yes…but if it is not tart and salty, then I’m not impressed. I always ask for LOTS of salt when I order a margarita. Quite refreshing on a warm summer evening in a west facing window apartment! I used up the left over ingredients the next day, except that time it was enjoyed out of a mug…I hope that is not too weird. I was given a very unique and privileged opportunity earlier this week that I said ‘yes’ to without even an ounce of hesitation. Keren Brown, creator of FoodPortunity, and known around the blogosphere as “FranticFoodie”, has out done herself yet again with a Food Photography Workshop in Seattle, called “FoodSnap!”. It is the first of its kind in these parts, and I’m proud to say that I was asked to be a part of it. I will be standing along side Lou Manna (man of the hour), Lara Ferroni, and Rina Jordan, in Kathryn Barnard’s studio! It will be a true honor. I can not wait to spend a day in the studio filled with food photographers and stylists, sharing our skills and techniques with one another! What a treat! SEATTLE, WA (August 29, 2009) – Seattle’s first of it’s kind all-day workshop for food photography, titled FoodSnap! will take place September 18th at the historic Georgetown Ballroom (inside the former Rainier Brewery) at 5890 Airport Way S.
The event, organized by Keren Brown Media and Foodista.com, will feature New York food photographer Lou Manna, (LouTheMan.com), the Olympus Visionary and New York Times photojournalist, commercial photographer, educator and author of Digital Food Photography. Lou is an associate professor at the School of Visual Arts in New York and a consultant in the Food Studies Program at New York University. He also teaches digital food photography workshops in his studio, and accepts students for private, hands-on classes. Lou will lead the workshop with the assistance of food photographer and blogger Lara Ferroni (platesandpacks.com) as well as Seattle’s top food photographers and stylists, Rina Jordan (rinajordanphotography.com), Charity Burggraaf (charitylynne.com )and others. The location, known as Georgetown Studios, is an ideal venue for photography and is often rented for commercials and advertising shoots. It is owned by Kathryn Barnard (kathrynbarnardphoto.com), a professional photographer whose work has been featured in top publications such as Seattle Magazine, NW Home and Garden and Ladies Home Journal. FoodSnap! is open to anyone interested in food photography. The target audience of FoodSnap! is food bloggers, food-related social media, food companies and food photographers. Cost is $159 which includes all fees for registration before September 4st. (Price will be $180 thereafter.) Attendance is limited to 75 participants. The sponsors, whose products will be used in the displays to be photographed, include Emily’s Chocolates, Frost Doughnuts, Fooducopia, Wink Cupcakes , Teaosophy and Red Ticking. Kathy Casey will be serving a Foodsnap Gelee signature cocktail that will be used as photo inspiration as well. The organizers will host a photography contest immediately after the event, providing participants with the incentive to upload pictures taken at the event and further enhancing the visibility of the photos and food products. Please check website periodically for details on contest and where to upload pictures to be reviewed. The Mayflower Park Hotel is offering a special rate for out-of-town participants, $139 plus tax for a classic guest room. Lou Manna will review and critique each participant’s food blog or photographs. He will show his own blog, Digitalfoodphotos , and social network site DigitalFoodPhotography . Following that he will use a Power Point presentation to provide an overview of the basics of digital food photography and tricks of the trade. He will review the different features found on most digital cameras, highlighting how they can be used correctly to photograph in any situation. The afternoon will be dedicated to hands-on practice. Groups of participants will have the opportunity to try their hand at food photography with the help of Lou Manna and Washington State’s own food photographers and stylists. Lou will demonstrate how to work with each specific light source, how to use mirrors, diffusers and small white cards to create mouth-watering photographs with a simple point and shoot camera. Participants will utilize new skills learned in the workshop to shoot each set up while Lou and his associates offer individual guidance to optimize each participant’s photographic techniques. I’m not sure if tickets are still available – they went on sale yesterday afternoon, and from what I understand they were looking pretty slim this morning. But if you are reading this, and are interested, go to http://foodista.com/foodsnap and see if you can snag a ticket before they are gone!